Whenever I shop at Kroger, I check out the clearance bins for good deals. 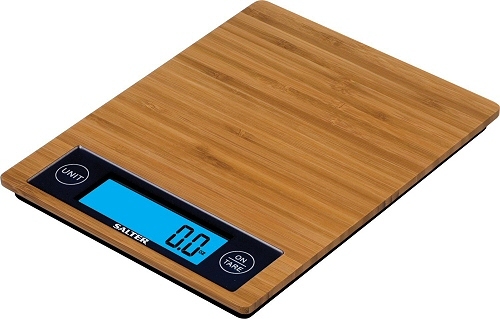 I got a super deal on a Salter bamboo digital kitchen scale today. The original price was $29.99 and it was marked down to $5.00! Although I already have another Salter scale, I've had it quite a few years and it has always been a little hard to read. The digital display has black text on a dark gray background. Also, if I set a plate on the scale, it covers the display which makes it even more difficult to read. 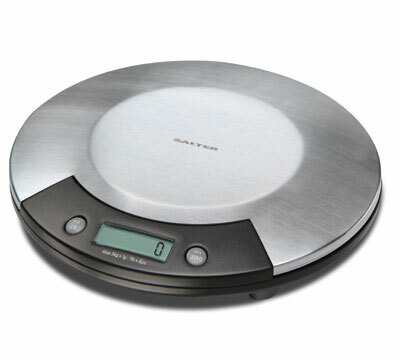 The new scale has a very large weighing surface and the display is huge and super easy to read. When I got home from the store, I looked up the scale on Amazon and was disappointed to see that it got very bad reviews. However, my husband tested it with jewelers weights and he said that it's very accurate. Hopefully I'll have better luck with mine than those people who wrote the bad reviews. I've used the heck out of it and it still works fine but I think the new scale will be even nicer to use.